The Trump administration announced last week that it would not urge schools to consider race in the admissions process. The administration withdrew official guidance meant to increase student diversity at schools across the United States. That guidance was developed during the presidency of Barack Obama. The move gives schools and colleges the federal government’s permission to leave race out of admissions decisions. 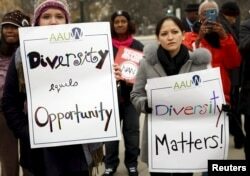 It is evidence of the politics that have long surrounded affirmative action policies. Those policies have repeatedly been at the center of cases heard by the U.S. Supreme Court. Yet civil rights groups criticized the move and some university officials said they plan to continue their diversity efforts as before. The Supreme Court’s most recent decision on the subject approved of the use of race in the admission process. But Justice Anthony Kennedy, who wrote the court’s opinion, plans to retire at the end of July. This gives President Donald Trump a chance to appoint someone who may be more critical of admissions programs that take race and ethnicity into consideration. The new policy is a big change from the thinking of the Obama administration, which had often said schools could consider race in admissions decisions to support diversity. In one 2011 document, the administration said courts had recognized schools’ “compelling interest” in supporting racially diverse populations. “Institutions are not required to implement race-neutral approaches if, in their judgment, the approaches would be unworkable,” the document said. It added that in some cases, such methods will be ineffective to creating the diversity the school seeks. That guidance has now been withdrawn. So were similar documents, including some which tried to explain court rulings supporting the use of race in admissions decisions. The Trump administration’s Justice Department had already expressed concern about the use of race in admissions decisions. This year, it supported Asian-American claimants who said Harvard University unlawfully limits how many Asian students are admitted. Civil rights groups criticized the Trump administration’s move. They say it went against many years of court decisions permitting colleges to consider race for admissions. The Lawyers’ Committee for Civil Rights Under Law released a statement from Kristen Clarke, its president and executive director. Lily Eskelsen García is president of the National Education Association. She said, “Affirmative action has proven to be one of the most effective ways to create diverse and inclusive classrooms.” She said the announcement signals the importance of Trump’s Supreme Court appointment. The new affirmative action guidance may add to U.S. congressional debate over Justice Kennedy’s replacement. The Associated Press reports that Howard University law school dean Danielle Holley-Walker criticized the new guidance. She said it is another sign that the Justice Department is likely to target schools that do continue to use race in admissions decisions. This is a clear attack on past legal decisions, Holley-Walker said, and that any Supreme Court nominee needs to be asked if they support past decisions on affirmative action. Eric Tucker wrote this story for the Associated Press. Phil Dierking adapted the story for VOA Learning English. George Grow was the editor. Do you think universities should consider race when accepting students to their school? Write to us in the Comments Section or on our Facebook page.